Bobby Kostadinov was born in 1999 in Leipzig and he has been playing cello since the age of seven. Sven Schreiber was his first teacher at the Music School Leipzig “Johann-Sebastian-Bach”, followed by Anna Niebuhr in the young talents class of the HMT Leipzig “Felix Mendelssohn Bartholdy”. Since October 2017, Bobby is studying violoncello with Prof. Peter Bruns at the same university. Bobby participates for years in the competition Jugend musiziert and received several times the first prize in different categories. In 2014, he received the prestigious prize “Felix-Mendelssohn-Bartholdy” together with his sister Diana Kostadinova. He received also two special prizes from the Deutsche Stiftung Musikleben, the special prize of the Hummel-Gesellschaft Weimar, a prize from the Ingeborg Fahrenkamp-Schäffler Foundation and the Central German Youth Music Prize of the Holger Koppe Foundation. Since September 2016, he is a scholarship holder of the Jürgen Ponto Foundation. From 2014 to 2017, Bobby participated with various ensembles in the enviaM-competition “Musik aus Kommunen” and received a first prize four times in a row at the national level. From 2011 to 2013, Bobby was the first cellist in the string orchestra of his music school and performed several times as a soloist at concerts. 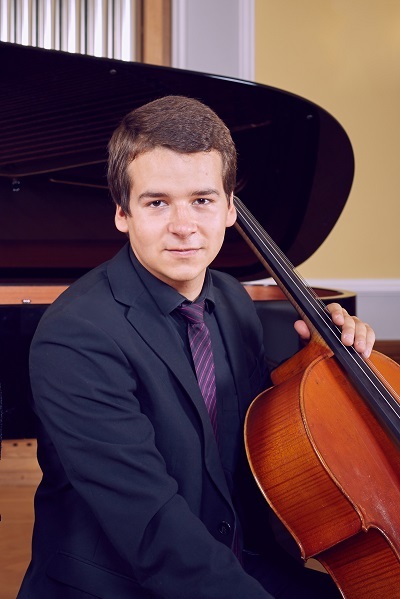 Since 2013, he has been a member of the Youth Symphony Orchestra of the Leipzig Music School and since November 2015 the first solo cellist. In 2017, Bobby performed Ludwig van Beethoven’s Triple Concerto together with his Trio Passionissimo and the “Bergischen Symphoniker” at “Marler Debüt” and “Jugend brilliert”. In the same year, he also performed as a soloist with the Youth Symphony Orchestra at Antonin Dvorak’s Cello Concerto in Leipzig, in Budapest and at the Wachau-Festival-Nights. If you are interested in working with Bobby, please get in touch with the EMCY Office.